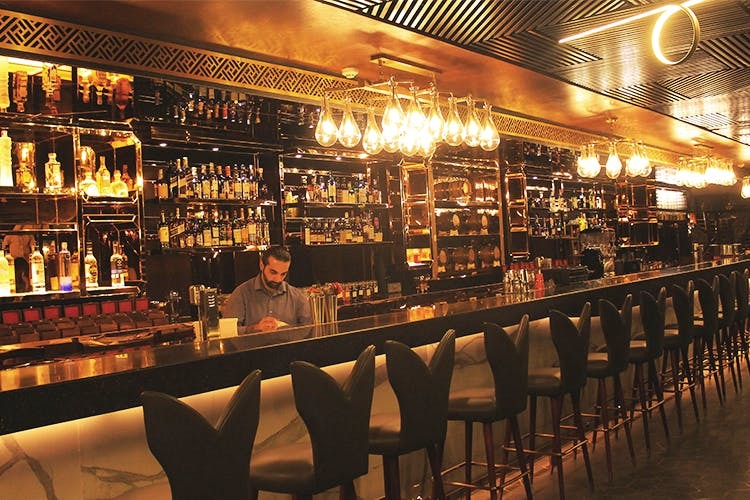 One of the newest bars in town, Novelé gives you experiential cocktails like no other. They’re seriously winning for their amazing bar and team of bartenders who are stirring up one amazing concoction after another. The cocktails are by far the best we’ve had in our young lives. Adding their own twists to signature cocktails, this is definitely a place you should try out if you’re someone who’s comfortable with shelling out some extra money on your liquor. They’ve got one of the best teams, with bartenders who’ve all worked at the city’s top bars, but what we loved the most was their dedication to making absolutely fantastic cocktails with flair and passion. We started with a rasgulla-infused whisky and the Tamil, a bittersweet concoction of Greygoose vodka and masala milk. We loved the Thermotini, a martini with a thermometer, which shows you when your drink’s temperature is getting hotter so you drink it quick (slow drinkers, here’s looking at you). With rows of exotic spices stocked on either side of the bar that have been sourced from all over the world, they place a great deal of importance on the ingredients used. Even for their food, the ingredients have been sourced from different countries, leaving you feeling spoilt for choice. They have a gorgeous (not to mention extremely organised) bar – we were lucky enough to get behind it and take a little tour. We’ll be honest – we didn’t eat much, but the corn-fried balls with a serving of radish and Godiva’s Delight (made with apple caviar and served with gold carat dust) left us in a tizzy. We finished up with the Rye Valley, a combination of Rye whisky and mandarin juice and a delicious champagne cocktail served with a healthy amount of cotton candy. We love the drinks here, and you’ll definitely see us sipping on some martinis once payday arrives. Keep in mind that they’re closed on Tuesdays.